Ice Grippers With Adjustable Velcro Strap. Available in: Black, Red, Blue. Minimum Quantity: 25. Folding Design. Credit Card Size when Closed. Other Colours Available. Folding Design. Credit Card Size Closed. Available in Red, Blue, Green, Yellow, Black. Displayed in Plastic Case. Minimum Quantity: 250. Have you ever heard of the phrase that a man's status is judged by his shoes?! Don't give this chance to your business associated to misjudge you which can result in a loss for your most anticipated business deal! Go stylish and elegant with our wide range of fancy shoes accessories and also help your business partners, employees and service partners to raise their status! 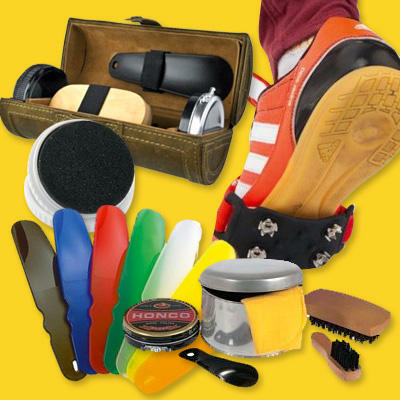 The never ending variety list of sumptuous shoe accessories including Plastic Cliff Shoe Horn, Sports Shoe Deodoriser, Instant Shoe Shine Sponge In White Case, Round Sponge Travel Shoe Shine Polish Kit In White, Graker Ice Grippers With Adjustable Velcro Strap, Dryfeet Shoe Dryer, Shoe Cleaning Kit In Black Luxury Cylindrical Case With Zip will help you alter the preconception which has wrapped the branding field that only big companies can enjoy the luxuries of branding.